Don't eat the yellow snow, polar bear number two! I think I'm hilarious. You can imagine how well this goes over at work. Apologies to Dennis Hwang. "Ok Google O number two, just turn your head and cough." Looks like the bears are giving out snowcones. I feel sorry for whoever gets the yellow one! Hee hee! I thought the exact thing when I saw that! Saw you on 60 minutes, lookin busy! 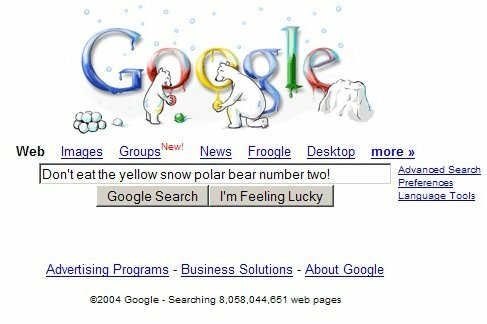 How can i get that polar bear theme for me google????? THat is so funny. I found it randomly and started cracking up. I sent the link to all my friends!